CALLING WOMEN 50+ IN THE GREATER BOSTON AREA. THE TRANSITION NETWORK INVITES YOU TO JOIN US! ​If you are interested in joining a dynamic group of women, making new friends, exploring new interests, please join us! SIGS bring together women with common interests. Existing groups include a Theater Buffs group, Book Club, Movie Goers, Community Volunteers, Sunday Brunch Diners, Mah Jongg Players, Travel Enthusiasts. Always looking for ideas, we will help get any new groups started. Potential new groups include Crafting, Day Trippers, and Game Players. There are three chapter-wide SIGS that are open to all members: Community Volunteers, Theater Buffs, and Sunday Brunch. You can request addition to those email lists and come when you can! Requests to join those groups or any others, please contact Joyce Blumenthal or Carol McKee. Peer groups consist of 6-12 women who meet regularly each month to engage in thought provoking and stimulating discussions on topics of their choosing. Discussion topics range from those that are light-hearted and fun to others that help members to define and think through their futures. These groups provide opportunities for connection, new friendships and mutually supportive exploration. Social gatherings, open to the entire Boston Chapter, are offered throughout the year. 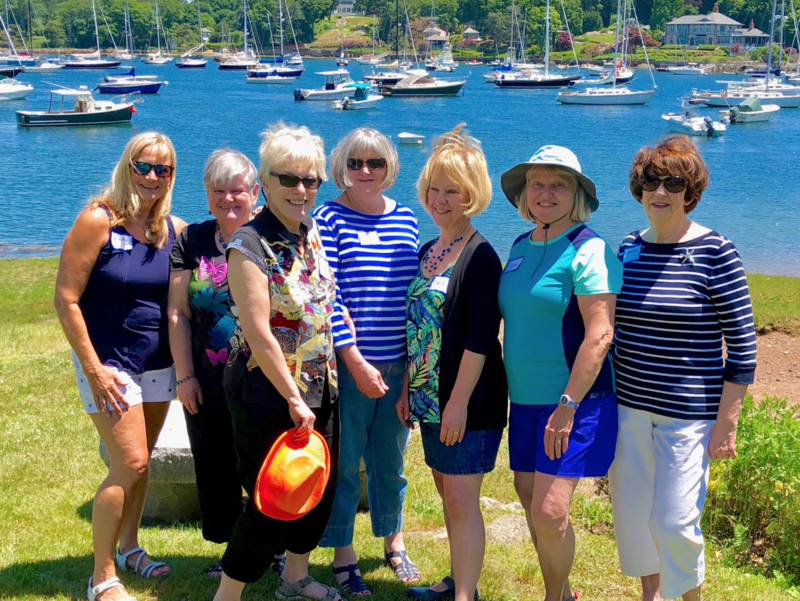 Examples include trips to the Newport Mansions, Peabody Essex Museum, House Tours, Holiday Parties, Charles River Boat trip, Pizza & Gelato Outing, WaterFire in RI, Vermont Weekend Getaway, on and on. Go with a member and try one or two events to see how you like it. Many social events, programs and SIGS are open to all. If you have any questions, please contact us at bostonchapter@thetransitionnetwork.org. On March 9, the Boston Chapter presented a newly developed TTN signature program, "On Resilience", to a sold out group of members and guests. The half day workshop, facilitated by Ginny Kiefer and Marilyn Kucera, received rave reviews from attendees. This is the Volunteer SIG doing their charitable good work with Cradles to Crayons this month. Members made a donation of clothing and also went on-site to assemble packages of winter clothing and supplies for children in need of these items. Here are some more photos showing the volunteers from the Boston TTN chapter working at Cradles to Crayons sorting clothes for packets to be distributed to children in our area. The Metro North Peer Group enjoyed a wonderful mexican dinner and celebrated two birthdays at their meeting June 20. Boston Volunter SIG Served Up Some Love! On January 6, 2018, Volunteer SIG members Joyce Blumenthal, Ginny Kiefer, Susan Spector and Audrey Tedeman prepared and served a home cooked meal at the Ronald McDonald House at Boston Harbor. Movie Goers Walked the Red Carpet and Enjoyed Oscars Evening! Movie Goers donned their most glamorous red carpet finery and attended an Oscars Party at the home of Celebrity Star Ginny Kiefer. Attendees strutted their stuff on the red carpet, cast their ballots for best picture and actors, played some intriguing oscar movie trivia, enjoyed an award winning sit down dinner and relaxed into a comfy sofa by the fire to watch the Awards Ceremony. The Boston Volunteer SIG helped Cradles to Crayons! The Boston volunteer Special Interest Group (SIG) had a fun and meaningful time helping out Cradles to Crayons. The Theater Group Goes on a Bad Date! The Boston TTN Chapter's Theater Group enjoyed dinner at Brasserie Jo before attending the charming and funny, Bad Dates at the Huntington Theater. Member Barbara Hyle, engaged 14 members and guests in challenging but fun activities designed to increase confidence when encountering a new group in social or professional settings. Theater Buffs on the Move - over Land and Sea! Know someone whose life would be more interesting and more fun with The Transition Network in it? Bring her! Facilitator: Barbara Hyle, former Director of Career Education and Alumni Career Services, Bentley University; Member TTN Boston. On Tuesday, March 21, 2017 at the Bedford Town Center, presenter Linda Tatten, CTC, Travel by Tatten helped eight people learn the right questions to ask to find the right cruise for a great vacation. Day Trippers - Peabody Essex Museum presents "Shoes: Pleasure and Pain"
The Inaugural Event for TTN-Boston's "Day Trippers" was a wonderful success. Even though the weather was cold, the brunch was delicious and the exhibit was bright with color and pizzazz! Facilitators: Rose Cummings, Jim Montanaro, Greg Dancer - Professional photographers and film makers.